The popular sci-fi action anime will be known on the channel as "Invincible Teacher". Terrestrial broadcaster GMA Network has announced in a television advertisement on Thursday that the popular sci-fi action anime Assassination Classroom will premiere on the channel this Monday. The anime is scheduled to have its television premiere on March 12, which airs Every Monday to Friday mornings at 08:50am, replacing the Dragon Ball Z Kai re-broadcast. The show will also be known on the channel as Invincible Teacher, most likely to appease any concerns by the Movie and Television Review and Classification Board (MTRCB), which is the country’s content regulatory body, and its advertisers. Assassination Classroom, also known as “Ansatsu Kyoshitsu”, is an anime adaptation of a manga series written and illustrated by Yusei Matsui, which was serialized in Shueisha’s Weekly Shonen Jump magazine from July 2012 to March 2016. The manga has a total of 21 volumes. 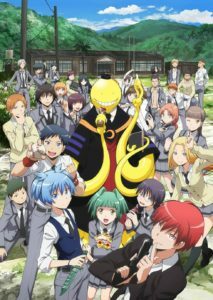 The first season of Assassination Classroom premiered on Southeast Asian anime channel ANIMAX Asia in January 2016, while the second season aired on the channel in July 2017. Last year, Philippine-based licensor Telesuccess Productions made the popular series available for the first time in Filipino dubbing through video streaming service iflix. The anime made a cameo in a feature story made by terrestrial broadcaster UnTV News & Rescue in 2016 about Atty. Eugenio Villareal, the Former Chairperson of the MTRCB, which they show the anime being reviewed for television broadcast.